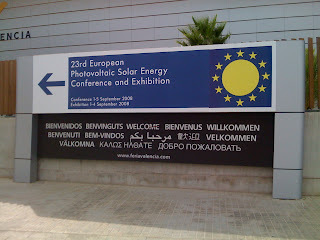 Not ready to brave a Valencia beach excursion, I decided to head over to the Feria Valencia on Sunday to obtain my 23rd European Photovoltaic Solar Energy Conference and Exhibition (EU PVSEC) Press badge and conference bag and to check out the venue. As it turned out, Press badges are not being distributed until Monday morning. However, I did have unprecedented access to the Conference auditoriums and Exhibition. This was not exclusive to me; anyone interested could have taken a good look around. Peter Helm, the Executive Conference Director, discussed the selection of Valencia, Spain, for the 23rd EU PVSEC in 2008, and the issues with distance between venues will be resolved. This was my only complaint about the 22nd EU PVSEC. It was much easier to dash between the Conference, Visual Presentations, the Exhibition, and the Press room in Dresden even considering the bratwurst gap. Did I mention Valencia has a beach? Although it was not running on Sunday, the Metro Valencia Line 4 Feria train stops almost at the front of the Feria Valencia. So the walk from the Metro to the Feria is much shorter than Milan was last year. In my opinion and although I am still walking challenged from my Hiatus incident, the walk from the Conference Venue to the Exposition Halls seems at least as long or longer than Milan. Adding to the journey, Auditorium Pavilion 5 is located down three levels in the Conference Venue, and the Exhibition Halls are located one level below the Foro Centro entrance. I heard exhibitors may not be so happy about this either. On the positive side, the Visual Presentation space is large and located at the entrance to Auditorium Pavilion 5 next to Conference Registration. Please view the following Picasa slideshow with select pre-23rd EU PVSEC photos including a minor story snippet in the captions. Adjustment of the slide display time may be required to read the captions. Date: 2 September 2008 Time: 9 P.M. 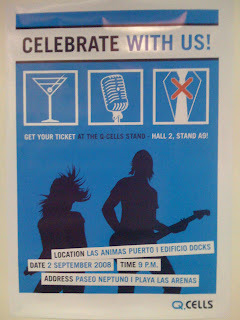 I suggest getting over to Q-Cells AG in Exhibition Hall 2 Stand A9 first thing on Monday to procure your ticket.